This manual is devoted to studies of early flowering plants. The manual describes important biological peculiarities of these plants, the procedure for assessment of their distribution and numbers within the area under study as well as methods for the recording of observation data and presentation of studies results. 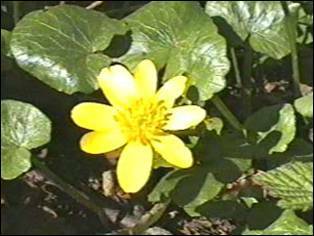 Early flowering plants are the plants of early spring flora, which blossom right after snow cover melts away. In the central part of Russia, these plants blossom in April (in some warm years, starting from the end of March) until mid-May. What is the biological sense of such early blossoming for this group of plants? The first and the most important reason is sunlight. It is well known that photosynthesis takes place in photosynthetic (green) organs of plants in sunlight, when organic substances, carbohydrates, are formed out of inorganic substances (water and carbon dioxide). Plants use carbohydrates for their growth and development. Thus, a sufficient amount of sunlight is a necessary condition for the normal development of plants. Forests located in the temperate climatic zone are richest in sunlight in early spring. Trees and bushes are not covered with foliage yet and nothing prevents the sunlight from freely reaching the ground. This factor is the main reason that many plant species have in the course of their evolution “chosen” early spring to blossom. That is why most early flowering plants are found in deciduous, especially broad-leaved, “dark” forests. There is another reason that plants use the “transparency” of spring forests that are free from leaves. Pollination occurs easier in a spring forests where there is no foliage. It affects wind-pollinated early flowering plants, such as well-known birches (different representatives of the Betula genus), aspen (Populus tremula), alder-trees (speckled and black alder – representatives of Alnus genus), hazel or nutwood (Corylus avellana). Nothing prevents the wind from transferring pollen from the male flowers of these plants (which are combined in polliniferous catkins) onto female flowers, which consist of small sticky pistils in early spring. When leaves on trees and bushes come out, they will prevent the wind from moving freely in the tree crowns. Insect-pollinated plants also use this season in their own way. They first attract insects with their bright flowers of yellow, blue and pink. Flowers of low-growing plants are poorly seen in the twilight of summer forest (incidentally, the flowers of plants found in the lower forest layer and that blossom in summer – oxalis, trientale, may-lily and others – are white in color, as it stands out the most brightly under conditions of insufficient illumination). One more reason for the early flowering of plants is the availability of moisture. The soil is saturated with moisture after the snow melts, and the moisture is necessary for the normal development of plants. Favorable spring factors (sufficient illumination and moisture) are better used by small plants, which belong to a group called ephemeroids. It is the most specific group of early flowering plants, which is narrowly adapted to early blossoming.